It's not that we dislike you. We just don't like you. See, we don't know you. Our interaction with you so far has been limited to selling you “un pain au chocolat s'il vous plait” or being in the same metro car with you or passing you on the street (more likely standing in your way on the street). At this point in our relationship, your presence does not naturally fill us with joy or bring a smile to our face. Also, we do not really care if the rest of your day is nice. We do not wish you ill, but if the rest of your day is miserable, this will not affect us. Tomorrow, if we see you again, regardless of how your day was, you will still smile insanely, ask us what is up and then instantly change the subject or simply walk away before we have a chance to respond. I have absolutely no time to blog right now, so naturally, that is all I want to do. But I won't. I will use the fact that my instincts are telling me to WRITE to actually write something for my school newspaper, where I have actual deadlines. Sorry, guys. That really does explain everything, and if when I find the time, I will elaborate. "Steal this Wi-Fi" If only Bruce Schneier were my neighbor. If only someone in my building read his blog. The Painted Veil (finished this week after reading it off and on, in Norwegian, for the past couple months). Not as romantic as the movie, but I don't know which I like better - or which is sadder. And I still don't really get the title, although there is a lot of talk of nuns. Stuff White People Like Number 67 describes me pretty accurately, including liking Belle & Sebastian and actually deciding on what my soundtrack is for different months. Yes, there is a "Soundtrack of Paris" playlist on my iTunes. I admit it. ... because Julie Balise decided that having the same first name, writing World News articles on elections for The Planet, drinking Guinness, studying the American presidential elections and having grown up in Massachusetts didn't make us similar enough; we should also be compatible on Last.fm. tofu. I can't remember the last time I did that. It was actually a good experience. ... hvis du bor i Oslo og savner meg: Jeg er i Oslo den første uken i mars. Det vil si at jeg reiser tilbake til Paris tidlig, tidlig om morgenen fredag den 7. mars. I always thought that if I lived in Paris, I would have a favorite café just around the corner, where Parisians have noisy two-hour lunches with wine, while the friendly, yet efficient waiters know me by sight and start making me an espresso as I walk in the door. And then I moved here and learned a sad, little secret: Parisians are good at cafés and bad at the actual coffee. Most French cafés use Robusta coffee, which is cheaper, can be stored for longer, and is generally considered to be of lower quality than Arabica coffee. About half of the coffee beans imported by the French are Robusta beans, according to the International Trade Forum. US coffee imports on the other hand, are composed of 76% Arabica and 24% Robusta. Canadian and German imports are similar to the US, and the Nordic countries barely import Robusta at all. So how do you get good coffee in Paris? Italian brands illy and Lavazza use only Arabica, so look for their logos. Le Malar, for example, on the corner of rue St. Dominique and rue Malar, uses Lavazza. Look for brûleries, the French word for coffee roaster. And then there is Starbucks, which is becoming almost as common as the traditional Parisian café. Just make sure you get your Starbucks coffee in an actual cup, as paper cups cool the coffee too quickly, seriously damaging the taste. Starbucks gives you exactly what you expect from a chain: consistently decent coffee, but never a fantastic experience. So where do you go for fantastic? On rue St. Dominique, there is a specialty coffee store called Comptoirs Richard, with a bar in the back of the shop where you can get excellent espresso. It’s a five minute walk from the Bosquet building, so this is a good choice for a quick dose of caffeine between classes. If you want to sit down, read newspapers and use WiFi, try espressamente illy, near Opera. With shiny metal decor and a display of brightly colored espresso machines, the atmosphere is far from traditional or French - in fact, it might seem a little cold. You can still enjoy a pretty good espresso. In the same area, you’ll find Verlet, with a long line of people waiting to get coffee for their homes, and gesticulating Parisians at every table. I loved their coffee cups, and I wouldn't mind occupying a table here for a few hours with friends. However, while their espresso was good, it would have been much better if it wasn't stored pre-ground in an open container. Once coffee has been ground, the taste is getting worse by the second. As a general rule, if you don’t see a coffee grinder behind the counter, get tea. My favorite is Cafeotheque Soluna by Hôtel de Ville. The espresso, which changes daily, is delicious, the friendly baristas clearly know what they're doing, and the comfortable atmosphere makes me want to bring a stack of books and newspapers and stay for hours. And as Parisian clichés go, a favorite café overlooking the Seine is just as good as one around the corner. During my first month in Paris, at an American university, (waiting for money from Norway), I have thought about what culture I really feel that I represent here. I am European because I drink wine without getting drunk, feel comfortable in heels and fishnets, and know that there is a price difference when someone calls my French number when I'm in France vs. if I go to Italy. I am Norwegian because I know that neither a croissant nor a baguette is real bread, think all drinks in Paris are cheap and arrive at parties wearing boots and woolen socks and carrying indoor party shoes. I am American because I sound like one and use "we" when I talk about the US. The ultimate test might be how I handle passing strangers. Paris is not designed to cope with this situation at all. I have this theory: There are too many Parisians in Paris. The metro basically works, as do the wide boulevards (although not near Galleries Lafayette) and even parts of the Champs Elyssée (although not on weekends). But the charming narrow cobble-stoned streets and the sidewalks on any street were not built for actual people who really need to walk from point A to point B. They were built for chairs and café tables, for smoking waiters, for signs advertizing the "formule" of the day, for slow-walkers who take their time choosing which boulangerie they should buy their morning croissant from, and of course, for small dogs. Oslo wasn't designed for people either, but this doesn't matter. First off, there aren't that many people in Norway. Secondly, Norwegians don't like interacting with strangers. This fear is hard to explain to Americans. What Americans call "friendly small-talk", Norwegians call "crazy/drunk/American/all of the above stalker tendencies". Norwegians back off when I come anywhere near an invasion of their personal space, which means they get out of my way. French people on the other hand, will not notice that I am standing right behind them. To get past them, I must either yell: "Pardon!" or just walk around them, in the actual street. If I meet someone face-to-face, the general rule seems to be that I must wait while they walk first, no matter what. Americans on the other hand, say "Excuse me," even if they are nowhere near me, just in case. They also smile more. The last time I went to the US, the first thing that happened when I got there, was that a stranger talked to me and smiled at me and it didn't feel weird. I knew I was home. When I came back to Europe, the first thing that happened was that a stranger ran over my feet with a loaded luggage cart and didn't apologize. And I knew I was home again. 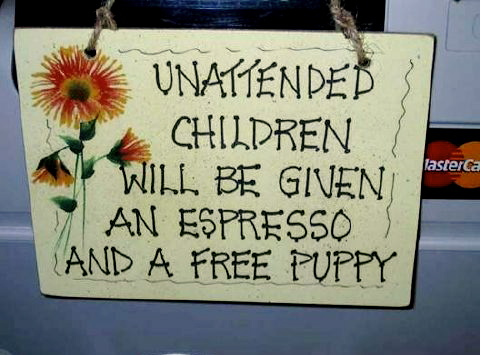 If I ever open a café, I will need a sign like this one. Especially given my previous record of giving coffee beans to small children.